Craps Table For Sale, Handmade in our Factory to your specifications. Call 480-983-3315 for more information on our large variety of craps tables. On Sale now with custom options available. Foot American Table Games showcase full line of Pool Tables from, Billiards Tables, Snooker Tables, and Carom Tables. You will be able to find quickly the kind of table by size. These pool tables come with multiple options in customizing the tables according to the clients idea. 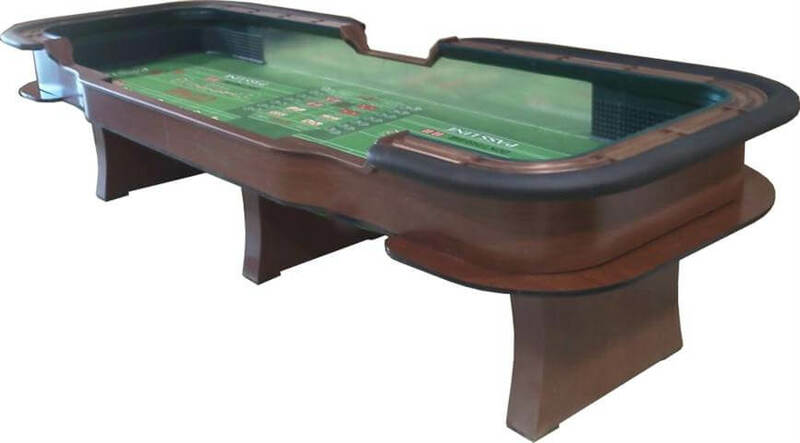 American Table Games 8′ and 9′ Craps Tables can be manufactured in a standard 1 piece tub or a breakdown 4 piece tub at no extra charge. That allows the table to be transported anywhere for casino parties, tight hallways, basements or upstairs. Most of our craps tables are built for “dice setters” so we make sure that the bounce and table dimensions are very true to the casino.